​Handicapped Parking: ALL SPACES at Church of the Holy Communion are reserved for handicapped parking. You may drop off at the church (218 Ashley Ave., Charleston SC 29403), and volunteers will direct you to nearby lots as follows. -- Arriving before 5 pm: Calvary Episcopal Church, 106 Line St., Charleston SC 29403. A shuttle service is provided from 2-5 pm and 7:30-9:30 pm. -- Arriving after 5 pm: The MUSC "QQ" Parking Lot, 142 Cannon St., Charleston SC 29403. 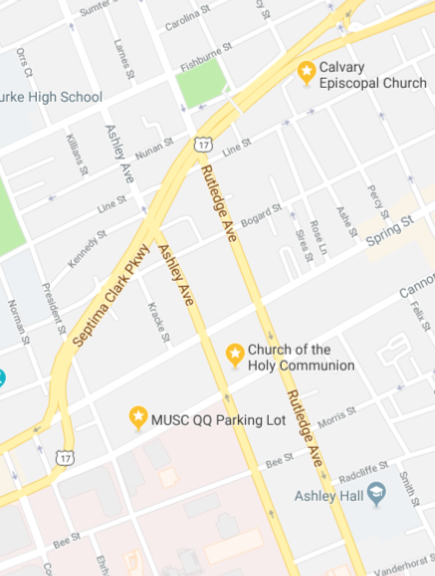 Saturday: The MUSC "QQ" Parking Lot, 142 Cannon St.